In the aftermath of the US presidential election, I’ve been reflecting on what it means to live in a post-truth world. I was shocked to read several accounts explaining that a majority of Americans receive their news via Facebook. “Trending stories” are highlighted in the right-hand margin of your Facebook page and serve as click bait. Since Facebook has already determined your political bias (check it out– it’s in your settings under US Politics), these stories play into each user’s biases and fears and are selected by algorithms, not people. Between 40-60% of Americans recently surveyed depend on social media as a news source. I wasn’t really aware of this problem of fake news until I read an op-ed in The New York Times. Suddenly I remembered a recent day on Facebook. I saw a trending news story, and I remember thinking, that’s an odd story, but I fell for the click bait. Within reading the first two sentences, I could tell it was totally bogus. It wasn’t until I read the New York Times column that I realized the proliferation of fake news stories, which may have played a role in the election. 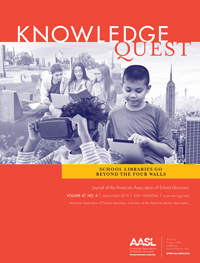 For years we librarians have been teaching our students how to evaluate websites and warning students about the dangers of going out on the world wide web without applying a critical lens to what we find. We remind our students to evaluate websites based on the acronym CRAAP: Currency, Relevance, Accuracy, Author, and Purpose (Gettysburg College). One of my best lessons for this I borrowed from Alan November’s Web Literacy for Educators. 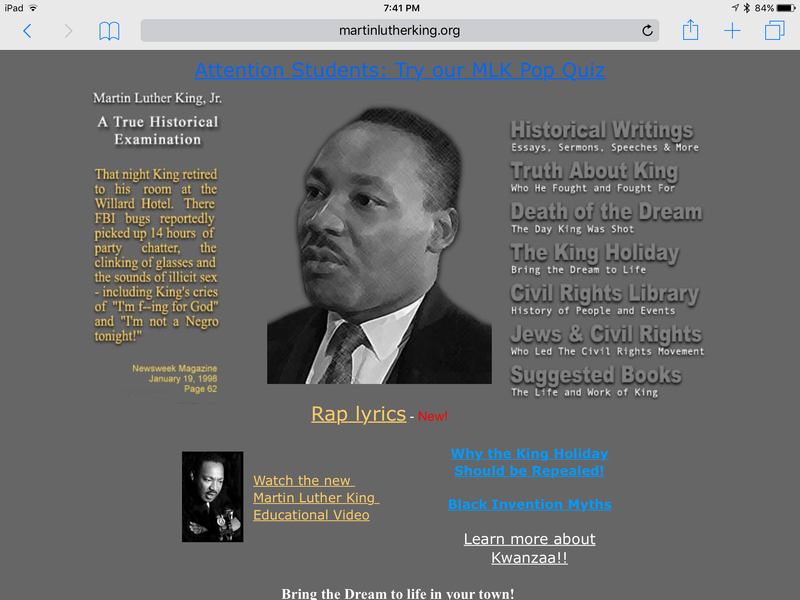 I ask my students if this URL sounds legitimate: http://www.martinlutherking.org. We all agree it does, and then we click on it. At first we see a portrait of Martin Luther King and a link for rap lyrics, but as we examine the site more closely, red flags go off in our heads. We then go to the domain identifying website, https://who.is/, to look up who owns the domain. 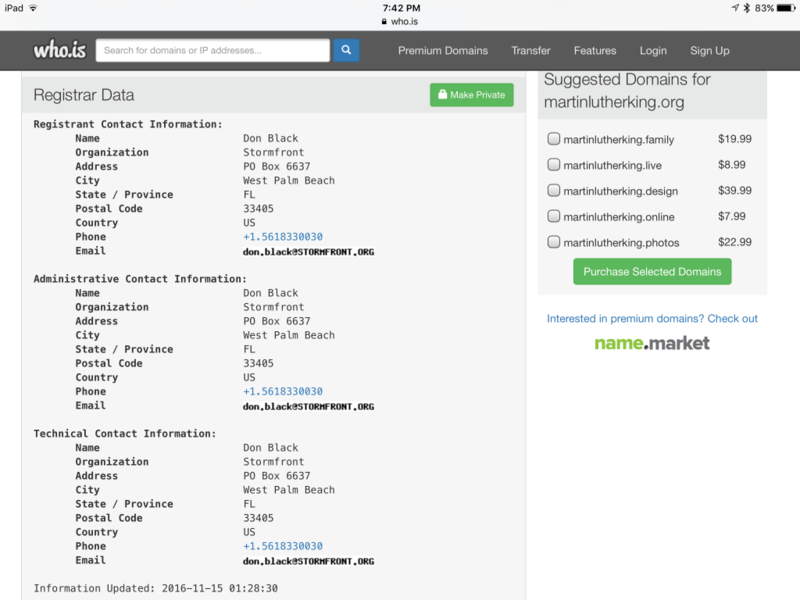 We discover the owner is Don Black whose organization is named Stormfront. Stormfront is a white supremacist organization that preys on naive young people in order to recruit them to its racist ideology. I can’t think of a more powerful warning to be careful on the world wide web. 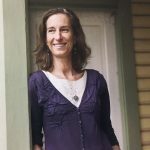 As librarians, we at times find ourselves in the awkward position of directing our family members to a Snopes.com article, proving what they just disseminated on social media was a lie. Of course, when so many Americans continually distrust the mainstream media, the fourth estate or journalism, “truth” becomes malleable, merely reflecting the reader’s own suspicions and biases. Still, we must remember that we are the gatekeepers and guides of information. In the olden days, publishers were the guardians of the truth, and whatever we read in print had a kind of trusted authority behind it. Now anyone can say anything on the Internet, including a seventeen-year-old boy who creates fake news sites from his home in Veles, Macedonia, in eastern Europe, according to the New York Times op-ed column. Here’s another example on the proliferation of false news, this time after the election. The source, USASupreme.com, is also based in Macedonia, according to The Washington Post. In this case, Google is the culprit. While at first defensive, both Google and Facebook have recently agreed to take steps to flag fake news and to cut off the ad support and earnings that motivate these fake news sources. There is even a Google Chrome extension you may want to download which alerts you to false news: https://www.producthunt.com/posts/b-s-detector. Then again, there’s no substitute for critical thinking. 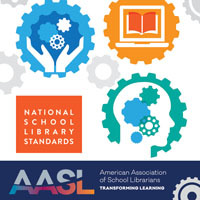 Not only is our profession as school librarians crucial in shining the light of literacy on our students, but we must never forget the importance of our fight against information illiteracy. The very survival of our republic depends on an educated, engaged, and information-savvy populace. Kristof, Nicholas. “Lies in the Guise of News in the Trump Era.” The New York Times. The New York Times, 13 Nov. 2016. Web. 13 Nov. 2016. <http://www.nytimes.com/2016/11/13/opinion/sunday/lies-in-the-guise-of-news-in-the-trump-era.html>. “Musselman Library.” Gettysburg College. N.p., n.d. Web. 14 Nov. 2016. <http://www.gettysburg.edu/library/research/tips/webeval/index.dot>. November, Alan C. Web Literacy for Educators. Thousand Oaks, CA: Corwin, 2008. Print. “WHOIS Search, Domain Name, Website, and IP Tools – Who.is.” WHOIS Search, Domain Name, Website, and IP Tools – Who.is. N.p., n.d. Web. 14 Nov. 2016. <https://who.is/>. Bump, Philip. 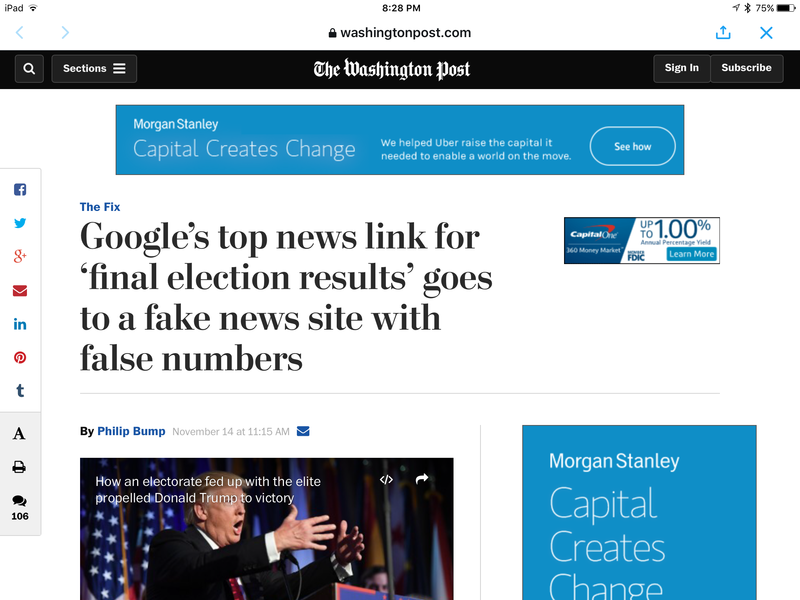 “Google’s Top News Link for ‘final Election Results’ Goes to a Fake News Site with False Numbers.” Washington Post. The Washington Post, 14 Nov. 2016. Web. 14 Nov. 2016. Dwoskin, Elizabeth, Caitlin Dewey, and Craig Timberg15. “Why Facebook and Google Are Struggling to Purge Fake News.” Washington Post. The Washington Post, 15 Nov. 2016. Web. 17 Nov. 2016. ‹ Time for a story – yours. I miss ImagineEasy’s Academy. 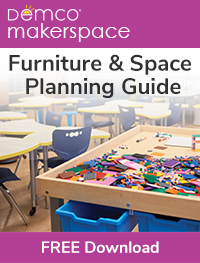 It was providing quality, customizable interactive training for all grade levels, with great built in assessments. If you come across something similar, let me know!